The Tube Axial Fan – TA1000 is designed for applications where higher volumes of air are required at lower static pressures. The most efficient operating range is from 0″ to 1″ static pressure and can satisfactorily be used in applications with up to 1.5″ static pressure. 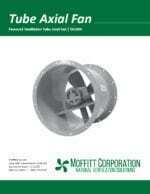 The Tube Axial Fan – TA1000 offers the lowest cost of the Moffitt Tube Fans. Sidewall and/or duct work mounting. How Can Building/Housing Construction Affect the Environment? © 2019 Moffitt Corporation. All Rights Reserved.